Tools provide two options- Export Users and Import Users. The former can be used for reporting, migration, and other data analysis, while latter helps for quickly importing in users from CSV file that might be generated from different site or resource. Select Group(s): This is step one of the export process, where all the existing groups will be displayed. One or multiple groups can be selected from which users are required to be exported. Select Field(s): On selecting group(s) from Step one, page will display “Select Field(s)” as second step. Here, we can choose the fields you that are required to be exported from above selected Group(s). If you want to export everything, click on a field and press Ctrl+A. Columns separated by: This is third step to specify separator to separate columns in your CSV file. “,” is most common separator and MS Excel, Apple Numbers and most other popular spreadsheet programs will open it normally. But if you want to import CSV in a specific app, do check what it recommends for separator. Export Button: Will trigger the export file creation action that will be saved to user’s disk. 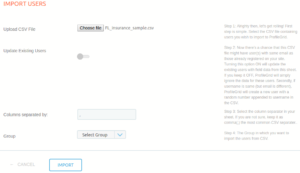 Upload CSV File:Allows selection of the CSV file containing users you wish to import to ProfileGrid. Update Existing Users: In case CSV file has user(s) with same email as those already registered on your site, turning this option ON will update the existing users with field data from the sheet. If you keep it OFF, ProfileGrid will simply ignore the data for these users. 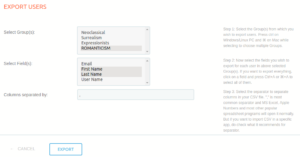 Secondly, if username is same (but email is different), ProfileGrid will create a new user with a random number appended to username in the CSV. Columns separated by:Select the column separator in the selected CSV file. If you are not sure, keep it as comma (,) the most common CSV separator. Group: Select the Group of ProfileGrid to which you wish the users to be imported to. Section: Select a section inside this Group where all imported fields will go. You may later redistribute the fields among different sections in Fields Manager. User Name: Username is one of the mandatory fields that will require to be mapped to. You can select a column in CSV file to map to username field of the Group. User Email: This is another mandatory field that must have mapping with a column in CSV. 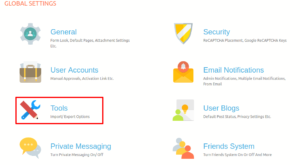 Make sure the column contain email Ids to avoid any issues. Create new field: If column from CSV file is not to be mapped to any existing field of the Group, this option should be selected. 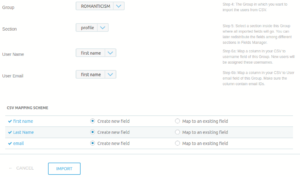 ProfileGrid will create a new field with given column name for the user. Map to an existing field: If column from CSV file is to be mapped to existing field of the Group, this option should be selected. On clicking the radio button, a combo-box will be displayed from which required Group field (to be mapped with) can be selected.